If you are considering an electric skillet, it is likely you have noticed the two general categories of skillets: Teflon and ceramic. Electric skillets are a major help in the kitchen when it comes to providing an extra burner, reducing energy costs, and deep-dish frying or baking, but ceramic and Teflon both have their drawbacks and merits. Nearly every new skillet these days is made with some type of non-stick coating, but the difference in certain chemicals is worth considering. In the end, you’ll want to evaluate how you’ll be using the skillet and weigh your expectations. In this article, we will be discussing the pros of ceramic coatings, as well as reviewing multiple products as we look for the best ceramic electric skillet. What are the Advantages of Ceramic? Is Ceramic Higher-Quality than Teflon? Are Ceramic Skillets Healthier than Teflon Skillets? In comparison to Teflon, the ceramic non-stick coating has been around for a relatively short time. 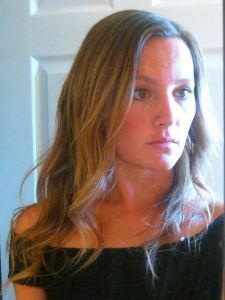 However, it has gained massive popularity in that timeframe and it is certainly worth looking into. Teflon has been known through the years for its impressive non-stick capabilities, though consumers have also become aware of its tendency to peel and flake. Is ceramic stronger while remaining just as non-stick? Non-stick cookware often utilizes chemicals called perfluorooctanoic acid, or PFOA for short. This chemical is also present in other processes such as food packaging and flame-resistant materials for repelling oils and grease. While this substance works beautifully for preventing cooked-on food, it is a known toxin and scientists are expressing concerns about human exposure to it in our food. Multiple gases are released when cookware with this coating is heated, and health professionals are beginning to connect links between the coating and long-term health effects. Research has suggested over time that using such types of non-stick cookware could possibly increase the risk of cancer and even a potential link to Alzheimer’s disease. That being said, research has additionally suggested lately that ceramic may be a safer option for non-stick cookware. Ceramic is known as a non-reactive substance, which prevents it from releasing any compounds into food as it cooks. Gases are not released when the pan is heated, effectively keeping your food uncontaminated. Ceramic may not be as completely slick as Teflon, however, it remains a credible option for avoiding cooked-on food and has been used as non-stick with fantastic success. A few companies are in the market of selling ceramic cookware and therefore claim that it’s incredibly stronger than Teflon cookware. Considering ceramic coating is still a relatively new product, time has yet to tell of its durability through the years. However, due to the compounds used in ceramic coatings rather than the chemicals in Teflon, ceramic is highly unlikely to flake. This fact alone means that more of the coating remains on your pan for continued use, and those chemicals will not end up cooking in your food. To that effect, ceramic cookware may indeed be more durable or successfully long-lasting than Teflon. However, care in choosing the safest utensil must still be taken when using a ceramic pan. As metal whisks, spoons, and spatulas can scrape Teflon pans, ceramic can be similarly damaged. 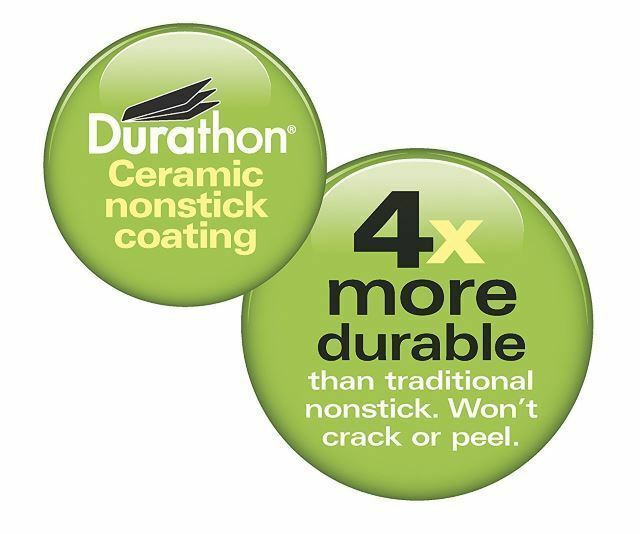 There is the possibility that ceramic may not scrape as easily as Teflon, though that could be due to the Teflon coating already flaking over time and with high heat. However, ceramic can still be damaged by metal utensils, so it is always a better idea to choose tempered plastic, silicone, or wooden utensils. These days, even with the scientific evidence of the gases released from Teflon at high heat, most Teflon pans are still considered safe. Modern skillets produced with a Teflon coating will not release any compounds until they reach 570 degrees, and everyday cooking typically doesn’t involve such high temperatures. Considering this, any new electric skillet should be fairly safe health-wise when it comes to avoiding released toxins in your cooked food. However, this doesn’t account for the flaking of the Teflon coating. Even modern Teflon pans will still begin to flake over time with use. These flakes will easily mix with your food. Research hasn’t shown for there to be a danger associated with ingesting these flakes, however, merely the knowledge of ingesting this chemical coating should be considered. As always, when Teflon pans begin flaking, they should be replaced. That said, it may be helpful to consider ceramic electric skillets, as the ceramic coating is merely susceptible to scratching rather than flaking. Ceramic skillets may have the potential to save customers money by providing a longer-lasting product. Additionally, consumers may find a peace of mind knowing the coating will not end up in their food throughout the years of use. Removable Base. This is common to find these days, but not every skillet is made with a removable base, so it is important to verify. A removable base makes cleaning several times easier, as you won’t have to fight handles or worry about the heat control. Dishwasher Safe. Even if a certain skillet features a removable base, it may not be dishwasher safe. 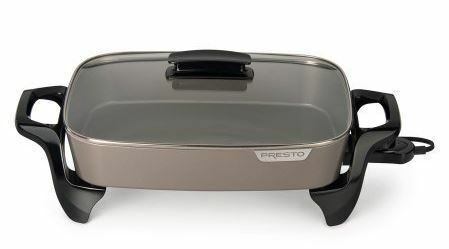 Electric skillets are often used for frying foods and will end up with tough grease splatters. This grease can be difficult to cut through when hand-washing, so a dishwasher-safe skillet may be quite helpful, convenient, and practical. It is highly popular for skillets to be dishwasher safe these days, but some of them still aren’t, so be sure to look for this label. If it’s dishwasher safe, the brand will proudly proclaim it. At the very least, the ideal skillet would be fully immersible even if it’s not dishwasher safe. Stay Cool Handles. There’s hardly anything worse than trying to hold a skillet and burning your hand on the handle. New skillets often come with a feature called “stay cool handles” so you don’t need to concern yourself with overly warm handles and knobs. Be sure to check the description of your ceramic electric skillet for this feature. Tempered Glass Lid. Older versions of electric skillets often had opaque, metal lids. These lids made it very difficult to monitor the cooking progress of the food. However, this has been changed by the implementation of tempered glass lids in many new skillets on the market. Between the glass and the vents for steam release, it is now far easier to monitor your food as it cooks within the skillet. This skillet is a great option for cooking large portions of food at a time. With a 16” surface space, the skillet could allow for numerous eggs, bacon, and pancakes, or merely large servings of any dish at once. This could be quite helpful for large families, get-togethers, and potlucks. Additionally, this electric skillet features a glass lid for easy viewing, stay-cool handles, and is fully immersible when the heat control is removed. Finally, the high walls of this skillet provide a deeper dish for baking, sauces, fried foods, and helps prevent the risk of spills over the sides. The depth of this skillet is nearly equivalent to a casserole dish and may come in quite practical for a number of recipes. This skillet would be a fantastic option for individuals who don’t mind hand-washing, and for customers who need a skillet large enough to serve a number of portions. 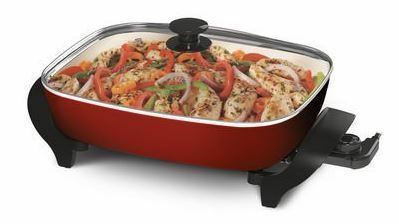 With the jumbo size and the high walls, this ceramic electric skillet would be a fantastic choice for party servings. 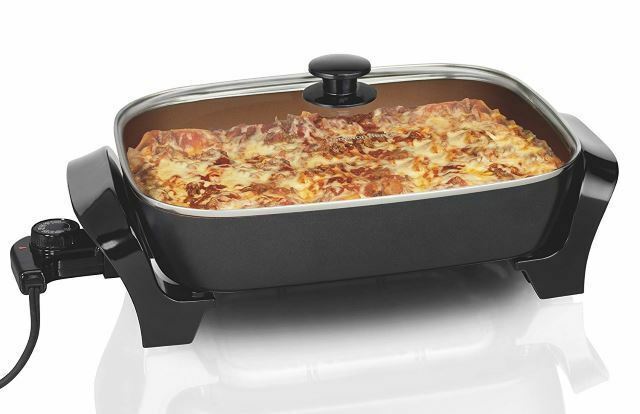 This Hamilton Beach electric skillet sports a 15” frame for cooking large amounts of food at once. Further, the large surface area can help with ease of flipping and stirring food without the risk of it sloshing over the edges. 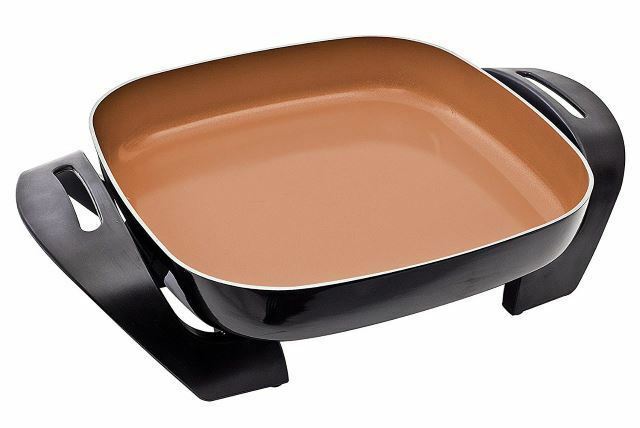 This ceramic skillet is considered deep dish with 3” walls for easily containing soup, small roasts, cakes, and oil for fried foods. In addition to the stay-cool handles, one of the best parts of the skillet is its dishwasher-safe capabilities, which makes cleanup fast and convenient. 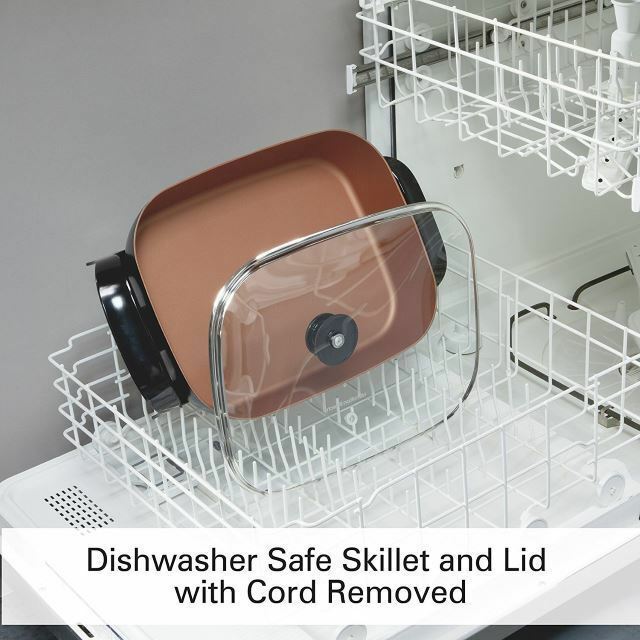 The base isn’t removable, but as long as the cord is unplugged from the base, the entire skillet and lid may be placed safely within the dishwasher. Finally, with a vented glass lid, it is not only easy to monitor your food’s cooking progress, but also to avoid steam burns when lifting the lid. This ceramic skillet would be a fantastic option if you need a large cooking surface and high walls, but also are looking for a dishwasher-safe option. If you would like the steam to release as it cooks to prevent the lid from fogging up, this is also a great skillet for your purposes. Oster is typically a great brand when you are looking for a product that isn’t going to break the bank but is still high-quality. This particular electric skillet takes durable non-stick coatings up a notch with titanium-infused ceramic. Titanium is known for its strong but lightweight properties, which would likely add impressive strength to the coating on the skillet. This strength would potentially result in a more scratch-resistant surface than with most ceramic coatings. As with the others, at 16”, this skillet is large, which can be quite convenient for ease of stirring or flipping food, as well as cooking large portions at once. 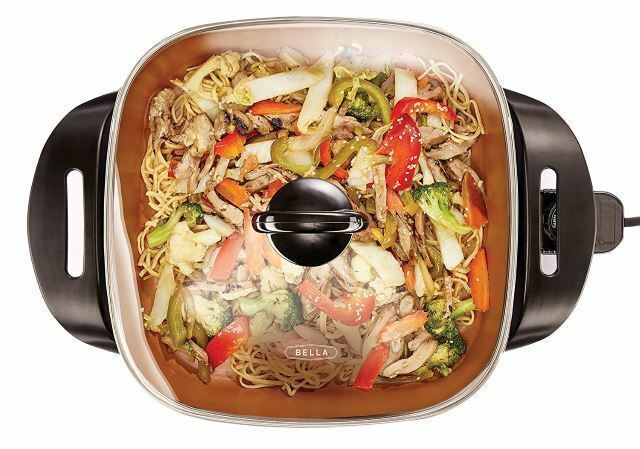 Further, this skillet is equipped with a glass lid and steam vent for easily monitoring your food as well as preventing a buildup of steam during the cooking process. This skillet would be the perfect option for customers who prefer the ceramic coating but are concerned about scratching the surface. With this skillet, the coating is likely much stronger and possibly longer-lasting even with consistent use. This would also be ideal for people who perhaps don’t mind hand-washing the skillet or don’t own a dishwasher. 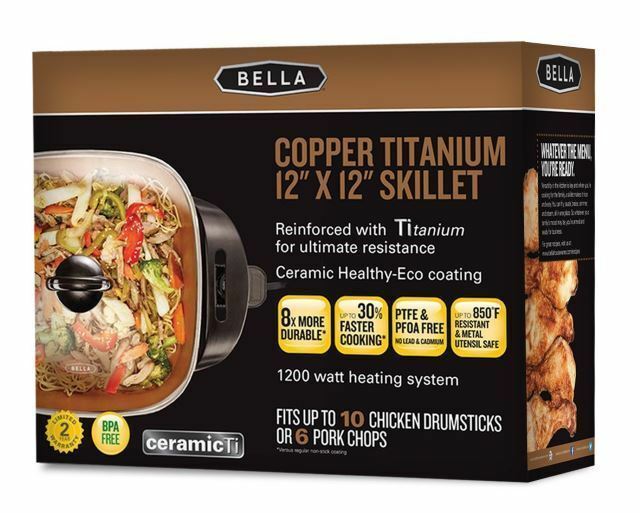 As with the previous product, this ceramic skillet is infused with titanium for additional strength. According to the manufacturer, this coating is strong enough even against metal utensils. This particular skillet has a slightly smaller size than the others, which could be helpful if you have limited counter space, storage space, or only need to use it for cooking a few servings at a time. In comparison to the other skillets, this could also be a quite cost-effective option, especially with the great features it still offers. For example, this skillet is not only quite durable with the titanium-infused coating, but it is also fully immersible, has a tempered glass lid, and the handles stay safe to touch. This would be a great option for customers looking for a small ceramic electric skillet with enough durability to eliminate the worry of grabbing the wrong utensil. This would also be ideal for individuals who don’t mind hand-washing the unit but are still looking for an immersible skillet. Cleaning absolutely cannot get any easier with this skillet! Simply remove the pan from the base and put it in the dishwasher. 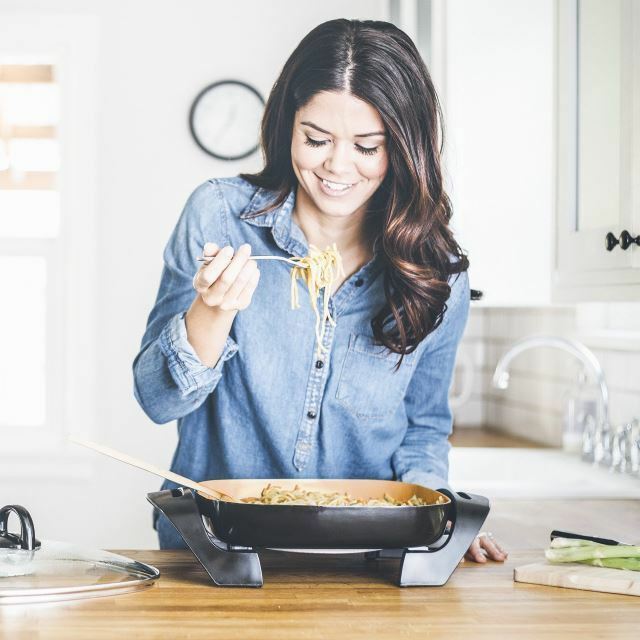 This skillet is completely immersible, dishwasher-safe, and easily detaches from the heating control base for the least amount of hassle possible. This is especially helpful for when you’re cooking fried foods and the pan needs extra cleaning power to cut through the grease. It can be difficult to wash even an immersible skillet in the sink due to the handles and extra bulk, so we love that this particular skillet is removable from the base. As an added bonus, even the base itself is dishwasher-safe! This feature could be quite helpful for handling spills or grease splatters. Some reviewers complain of the base missing rubber feet. This is something to look out for, as the missing part may need to be shipped out afterwards. This skillet would be an excellent option if you are looking for no-fuss cleanup and don’t want to spend your time scrubbing away grease and grime. Additionally, this would be ideal for customers looking for a skillet with a large cooking area and a vented, glass lid for viewing their food. Ceramic offers a legitimate alternative to traditional Teflon non-stick coatings without the risk of flaking or exposure to chemicals. These skillets are effectively non-stick and have been seen as fairly durable. When we considered the most ideal features for ceramic electric skillets, it became apparent that dishwasher-safe options were preferable. The food involved with electric skillets is often messy and greasy, and the thought of skipping the brunt of that cleanup is certainly favorable. Further, we noted that the ideal skillet would offer a vented glass lid for easy food monitoring and moderating steam buildup, as well as handles and knobs that remain cool during the cooking process for safe handling. 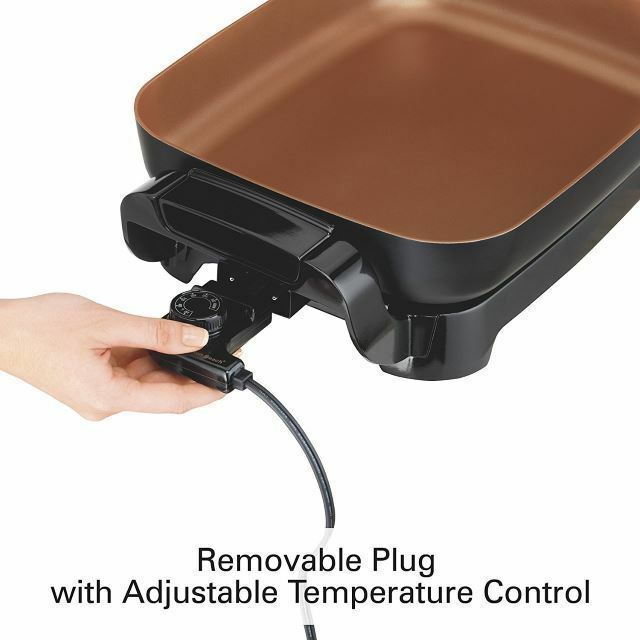 Finally, it would be especially helpful for an electric skillet to feature a removable base for less bulk and difficulty when it comes to cleaning, regardless of whether the skillet is immersible or dishwasher-safe. Considering these preferences, it has become clear that the best ceramic electric skillet is indeed the Hamilton Beach Ceramic Copper & Black Electric Skillet. While all of the skillets listed are excellent options, we feel as if this skillet comes closest to checking off each ideal trait. The description of this skillet may not specify stay-cool handles, but as it is odd to find a modern skillet without this feature, we anticipate that the handles will likely remain safe to touch during use. The skillet is fully dishwasher-safe, includes a vented glass lid, and the frying pan itself can be completely removed from the base. This electric skillet has certainly impressed us and, in our opinion, it comes out slightly above the others.